Donating just one bar of soap can make a huge difference in someone’s life. If you’re looking for ways to give back to your community, this post can help you get started. There are many advantages to giving back, most importantly that you’re helping someone in need. Kate with Soap With Hope said donating handmade soap is often unexpected but so appreciated. Kate has been selling soap for about 5 years. After she was diagnosed with cancer and started a rigorous treatment program, an office job wasn’t a possibility for her. She wanted to be home with her family. “Moments and memories are the most important things to me,” she said. 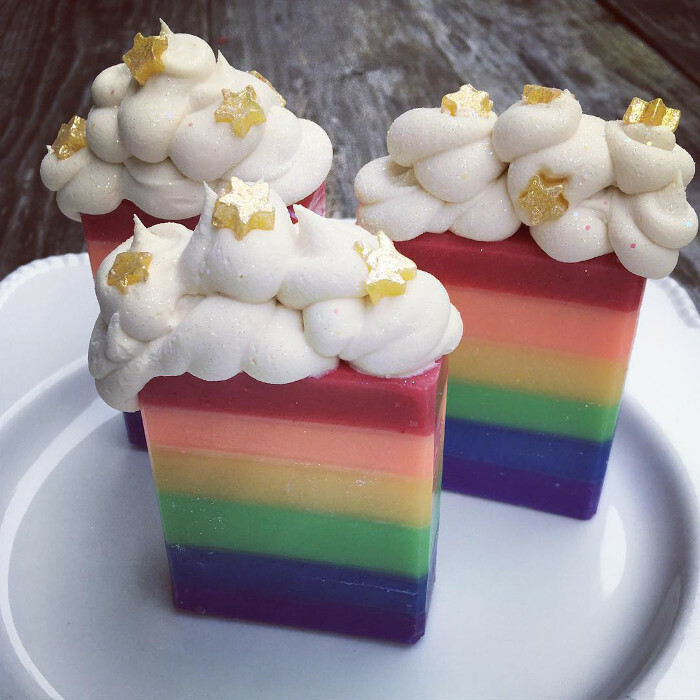 Soap With Hope’s Over the Rainbow bars. 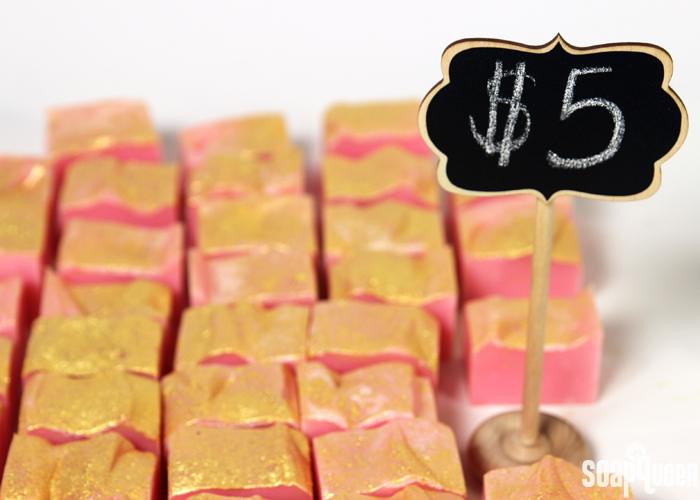 Soap With Hope donates 25 cents from the sale of every bar to cancer research. Kate also gives soap and other supplies to several charities. She started giving back because so many people helped her along the way and she wanted to pay it forward. It was also important to set an example for her children. Amanda with Lovin’ Soap Studio said giving back can also help strengthen your relationship with the community. Amanda and her husband founded a non-profit called the Lovin’ Soap Project. Members work to improve the lives of women and girls through health, education, artisan soapmaking, business planning, and economic development. Cold process soap made by Lovin’ Soap Project participants. Amanda said supporting a cause can connect you with other businesses and leaders in your community. If you have employees, it can boost their morale knowing they work for a company that lifts other people up. You may even inspire employees or others in the community to give back as well. All of these factors can help create trust between you and your customers. Amanda said they want to know what businesses stand for, not just what products they sell. They’re more likely to buy from a company that supports a cause, especially if it’s one they know and support. Learn more in this article from Forbes. 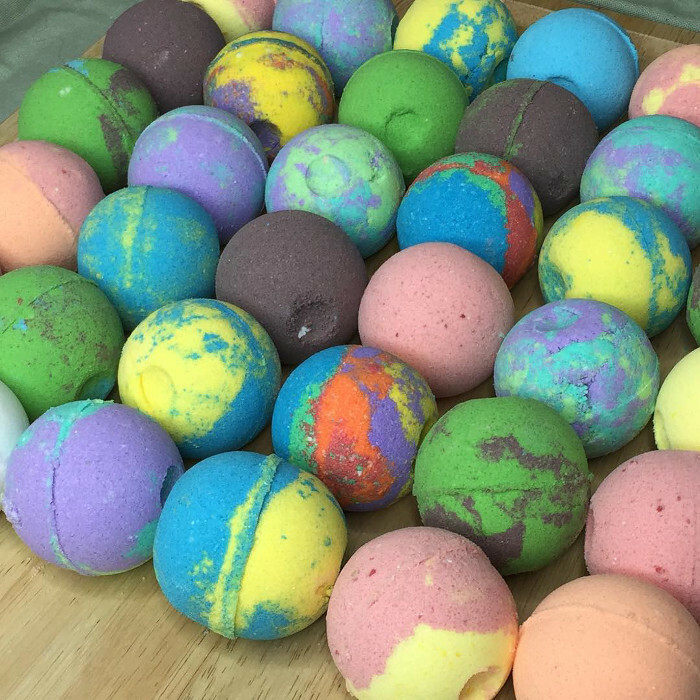 Colorful bath bombs by Lovin’ Soap. There are a lot of charities out there doing great work, so it can be hard to choose which one to support. It helps to consider what you and your customers feel strongly about. If they love animals, check out your local animal rescues. If they’re passionate about the environment, research nearby conservation groups. There are also plenty of resources online. Amanda recommends Charity Navigator, which rates non-profits based on their financial documents and public support. If you’re still not sure, ask your customers. Amanda said you can send out a survey or let them vote on a certain cause every quarter. Don’t be afraid to talk about your efforts and keep your customers updated. Friends are also a great resource – Kate said simply asking on Facebook will give you a lot to work with. “Once you start, you’ll be amazed at how many people have charities to suggest,” she said. Once you have your causes selected, you can focus on what you’re able to give. One option is donating a portion of your sales. How much you decide to donate depends on your pricing structure – check out the How to Calculate the Price of Your Products post for more information. You can try a few different donation amounts to see what works. The How to Calculate the Price of Your Products post can help you determine how much to donate. We love our community, so Bramble Berry donates to various Whatcom County organizations like Lydia Place. We recently donated a portion of sales from our new 35-pound pink buckets to the National Breast Cancer Foundation and Domestic Violence and Sexual Assault Services here in Bellingham, WA. Learn more about those donations here. If your business is small or if you’re just starting to sell your products, donating a portion of sales may not be an option for you. The good news is there are other ways to give back that may be more cost effective for you. For instance, you can volunteer and highlight the organization on social media or your website. Amanda said another option is a cause product. It can be anything you like – a batch of soap, bath bombs, a gift set with lotion and lip balm. The proceeds of that product can go to your favorite charity. You can make a new batch every month, once a quarter, or once every 6 months. It’s important that you’re able to do it comfortably. Another option is donating products to local shelters. 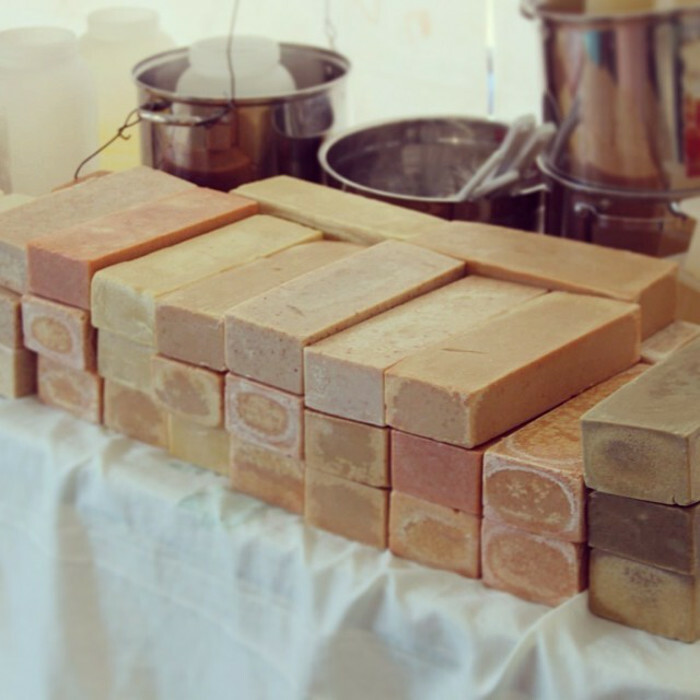 Soapmakers often have scraps, end pieces, and test batches in their homes. Kate said even if it’s a batch you’re not proud of, it will mean a lot to someone in need. You don’t have to donate a lot either. Just do what you can. “I promise you can make anyone feel better with a beautiful bar of soap,” Kate said. I make soaps from my trimmings, offer them for donations and give the money to local charities. The recipient changes each month and is posted so people who donate know where their money is going. The local women’s shelter is my favored charity and I make gift bags Christmas, Mother’s Day and other times if I have extra products. That’s awesome, it really makes a difference to someone in need.